A neat and compact drinks trolley made entirely from beechwood with a beautiful curved, oval shaped body made from steam-bent beech. 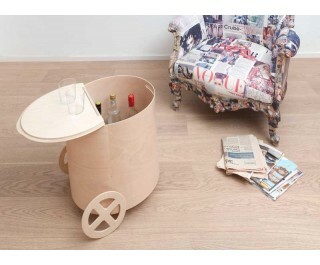 At 54cm high, the whimsically named Big Bang Trolley Bar is the perfect companion for beside the sofa or dining table, to carry drinks or in which to store and transport bottles, within the body of the trolley. The lid opens to create a half-moon shelf on which to rest bottles or serve drinks. The trolley has a set of wheels and a stand so that when lifted with the handle, it can be pulled along, but ensures that it is equally stable when static.